My friends and I often joke in nonsequiturs. For example, Wet Owl, an internet meme to my group of friends and something that confuses everyone else who comes in contact with it. So a few days ago, a friend and I were talking about Michigan football; we discussed all of the awful things that have happened the past two years and that something similarly awful had to happen this year. We decided that the most damaging thing that could happen to the team was the sudden loss of Troy Woolfolk after he broke both arms and legs in a tragic bear attack. In this regard, the news that Woolfolk dislocated his ankle and is now out for the season is at least partially my fault. Not to over estimate what happened today, but the injury to Woolfolk may very well mark the end of the Rich Rodriguez era at Michigan. Unless Floyd, Christian, and the Talbott/Avery platoon drastically outperform their recruiting rankings and on-field play, Michigan's defense just went from having the potential to be a middle of the pack Big Ten squad to easily the most vulnerable defense in the Big Ten, if not one of the worst in the country. Woolfolk's loss is really that impactful. And that's assuming there aren't any other injuries during the year. At this point, I'm glad I'll be away from my computer for the next three or four days. I'm just exasperated. I don't know what to do anymore. Can anything go right for this program? How many bad things have to happen until our luck turns? 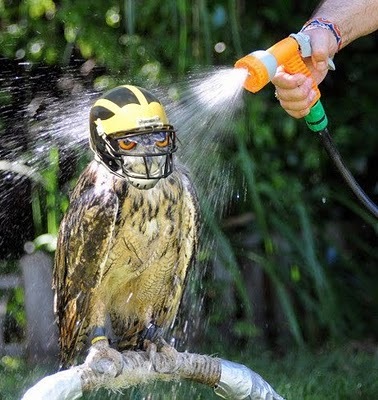 For now, put on your Maize and Blue colors and just stand there as God sprays you with a water gun. It's about to get ugly.